When talking about the art market, we immediately think of record bids and the ensuing rampant prices. What we don't truly appreciate is that it is also the antechamber to the museums, and thus an extraordinary breeding ground! In this respect, 2015 was a vintage year. Even if provisional, the figures speak for themselves, with over €4.5 M spent on pre-emptive purchases alone last year compared with €1.37 M in 2014. Splendid growth, and extremely healthy for Drouot. The famous saleroom, previously the setting for forty-six purchases totalling €600,000, achieved nearly €3M in 2015. The Bibliothèque de France and the Louvre were the most assiduous buyers. (The latter had already pre-empted a bust of Charles Fréderic de la Tour du Pin by Bouchardon for a spanking €3.75 M in 2012.) 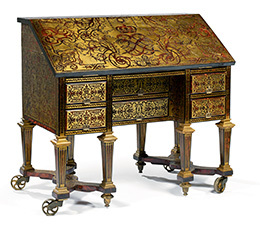 In 2015, the top buyer was the Château de Versailles, which treated itself at the judicial sale staged by Vincent Fraysse to a desk made in 1685 for Louis XIV's Petit Cabinet, the only one (with its matching desk, now in New York's Metropolitan Museum) incontestably by Alexandre-Jean Oppenordt. This present cost €1,487,200: a princely sum for a royal institution! 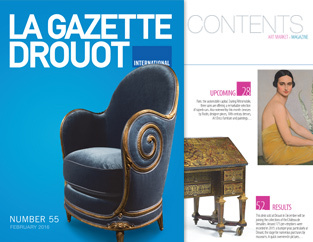 Drouot has most certainly confirmed its label: museum quality! On the Corniche, the road between Nice to Monaco, Grace Kelly spins along at the wheel of a gleaming Sunbeam Alpine MK1 beside Gary Grant. The sky is blue, the light is dazzling – and the image incidentally won Robert Burks the Oscar for Best Cinematography in 1956. The scene, shot in spring 1954, is one of the most famous in Hitchcock's film "To Catch a Thief". This Sunbeam Alpine, produced by the British carmaker Rootes, was part of the cast. The Musées Nationaux lead a double life. When they are not devoted to permanent or temporary exhibitions, they are busy preserving tomorrow's heritage behind the scenes. This duty of memory, which requires both talent and expertise, would not be what it is without the moulding workshop of the RMN-GP (Réunion des Musées Nationaux-Grand Palais), a place of memory unique of its kind, which can justly be considered one of the best distribution tools for culture to date. British sculptor, Richard Deacon needs no introduction. He was the winner of the Turner Prize in 1987, and the Tate Britain dedicated a retrospective to him in 2014. Today, this colossus in the world of sculpture is exhibiting works alongside Sui Jianguo and Henk Visch at the Fondation Maeght in Saint-Paul-de-Vence (“Three Men in a Boat”, until 13 March 2016).